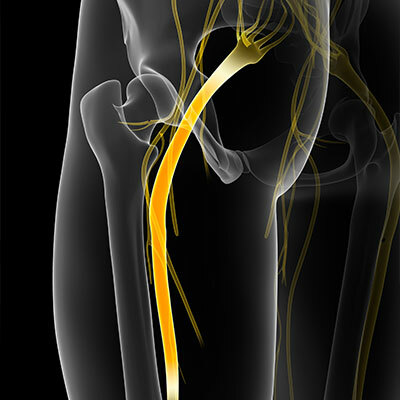 Sciatica is the term used to describe pain in the sciatic nerve. The sciatic nerve is the largest bundle of nerves in the human body and it extends from the low back, through the buttocks, and down each leg. The sciatic nerve contributes to all the nerves in the legs and helps communicate with all the leg muscles. Sciatica can produce symptoms such as sharp pains, achy joints, feelings of pins and needles, burning, numbness, and tingling sensations among other symptoms in the legs and low back. Sciatica can be caused for several reasons including, injury, subluxations in the lumbar spine, herniated disc, bulging disc, and even non-spinal disorders like diabetes, constipation, and neuropathy. Chiropractic care may be able to help the body heal itself by allowing the sciatic nerve to communicate freely with the lower half of the body. However, success with chiropractic treatment will depend on the patient's level of pain and nerve damage. In severe cases, a patient may want to try laser therapy or some other form of nerve treatment such as a TENS device or ultrasound therapy. However, a chiropractic adjustment at Zemella Chiropractic in Santa Barbara is focused on realigning the spine and eliminating subluxations in the low back and pelvis to help relieve sciatica symptoms. To learn more about how chiropractic care can help relieve pain from sciatica, call Zemella Chiropractic in Santa Barbara at (805) 324-6500 to schedule an appointment today.